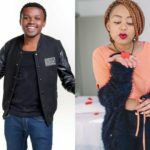 Chipukeezy and his short-term light-skinned girlfriend, Kibanja are now one after giving us a sneak peak of their wedding rings. Chipukeezy has been dating his hot girlfriend, Kibanja for couple of months now and has made it official. The two flaunted their engagement through a video on social media just days ago. Chipukeezy however denied that the story ought not to have been live but are now instead flaunting their wedding rings. The duo was not well received in the public eye, many having bashed at his new bae, Kibanja who they didn´t think was up to it. However, looks like they gave their backs to the naysayers. The NACADA director is closer to his 30´s unlike Kibanja, who is just enjoying her early 20´s. The Comedian and Ebru TV show host however promises to unveil little details of his better half come the 11th of May. Chipukeezy was previously engaged with Empress Kerry for close to 4 years before calling it quits. Looks like a ´thing´ among today´s popular circle, Chipukeezy did not let her lady walk down the isle. The post It´s official! Chipukeezy and his howty, Kibanja are now one appeared first on Ghafla! Kenya.